Will's Korean Journey: Rediscovering your past. Have you ever needed a cheap trip down memory lane. How about a reminder of all the things that make you feel like your childhood is still a tangible and living thing. Sadly, as we enter our rush to grow up, which honestly seems like an eternity we tend to forget everything that we loved from our younger days. I was reminded of that today when I noticed my co-teacher watching an Animaniacs video. Now for those of you who may be of an older generation, Animaniacs was a cartoon series that I watched religiously in my later elementary school days. 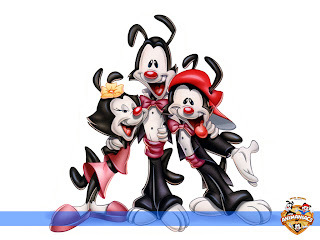 The show revolved around three main characters: Yakko(middle), Wakko(right), and Dot(left). The show was relatively crazy, yet at the same time would do spats of educational material. Yet, just by watching five minutes from this show I was sent back to a time where I was young and free. The world lay at my feet and I could do anything in the world. Granted at that time I was still actively considering a career as a jet pilot (thanks Top Gun), baseball superstar (I wanted to be Rickey Henderson), or life as a Rockstar (damn you Poison, Whitesnake, and Bon Jovi). Yet, even now I look back at life, and I wonder, how could things have turned out differently? How could things be worse, how could they be better? What if I had gone left instead of right? What if I had gone down instead of up? It's amazing to think that a simple show, which brought so much laughter and happiness in life at such a young age, can now bring so much reflection. You'll laugh 'til you collapse"
Poison and Bon Jovi? I seem to remember you doing stuff like Third Eye Blind, The Chronic, and Bare Naked Ladies. Did that stuff just come later? You are true, but that music came later. This was in the glorious days where Hair Metal ruled the Universe and Every Rose Still Had It's Thorn.